Trinity’s outreach ministries have proudly served residents in the North Hill community and the larger Akron area for several decades. They embrace Trinity’s community involvement mission statement, which is “to open our doors to be part of the solution to the challenges of Akron’s North Hill community”. Known as Trinity in the Community, or T’nC, our outreach ministries include a Clothing Ministry and Food Pantry Ministry. 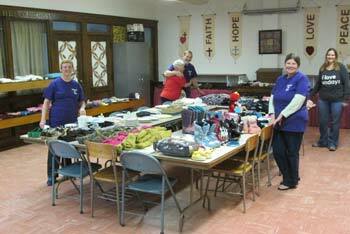 These ministries are operated by volunteer staff who rely on both donated items and financial gifts to purchase new items. Our Clothing Ministry is open to the public from 1:00 to 2:30 p.m. on both the 2nd Saturday and last Wednesday each month, although residents may attend only once per month. Both adult and children clothing are available. We offer general clothing and footwear as well as seasonal clothing, including jackets, coats, scarves, hats, and gloves. In addition, we have a limited supply of personal items, such as underwear, socks, bath towels, linens, blankets, plus miscellaneous donated household items. General school supplies and backpacks are also available at the beginning of the school year. Residents are provided with a bag to fill with clothing and other items.